ART can only be of service to the market if it is outside the market. Otherwise the market dictates the art, art functions outside of systems. Art functions non-competitively within the culture of the artist and her experience. C4 Atlanta Blogathon – Day.8.Feb.2014. The Still Point of the Turning World……March 6.2014.
Who supports your daily life? I am so very grateful for the support in my life, friends, family and community. All are profound gifts of Love and contribute to my ability to create. What supports my daily life? Something from deep inside that has always been there, a part of me, that quests, wonders, is amazed at times, scared at times, in awe at times,in delight. As time goes on, I experience all of that fully; the feelings, the thoughts the sorting it all out. Then, ultimately, there is the sublime still point of the turning world. Day 5 artists blogathon ignited by : C4 Atlanta March.5.2014. What gives you satisfaction in the studio? Just being in the studio is always a bit like stepping out of time for me, time both stands still and is brilliantly focused/present when I am fully engaged in making an art work. It often means struggling with resolving a problem; it’sbvisual and conceptual at the same time, then it feels like a kind of delicous puzzle. What are you currently exploring there? Currently I have been doing a review of my past art works, a process that seems to occur about once a year for me. It involves seeing what there is to learn from past work, to carry over, just ‘take stock’ of my visual markings. Also I’ve been working on a collaborative piece with a writer in Seattle : Ronna Dettrick, I actually met her through the web and was attracted to her blog because the heading read, Renegade conversations, Feminism and Faith. Being a feminist and also having a sense of my own Sprituality her words spoke to me. She put a call out for an artist to work with her. The project we are now collaborating on stems from Ronna’s writing. The theme is to depict 30 women from ancient texts/scripture whom are then re-envisioned through a Feminists viewpont, the result, empowering to women, a contemporary version of Spiritual mythology for Women. 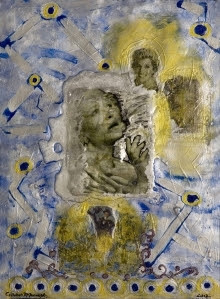 I have now done 5 of those paintings from which I create giclee prints (available : www.RonnaDetrick.com ). It has been an engaging and growthful experience for me, and I really love working with Ronna, she is one of kind, brilliant and geniune. What is the wish list for your work? I would eventually like to have a seperate building of about 1,000 sq ft at ground level with lots of windows. 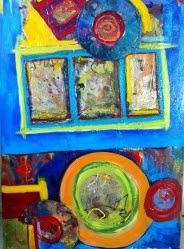 I’d also like to find representation/gallery for my paintings that supports exposure and also sustains me economically. It is important to me that my work ‘get out’ and hopefully have meaning to others. What studio goals would allow for ecstasy? Having increasing time, un-interupted, to do my work and more community with other artists. Lastly to continue to experience my craft/talent maturing and growing. a quickie post to end a really fun evening of comradrie, good friends, being in the NOW. March 4.2014 day 4 blogathon C4 Atlanta I am wiped out from having sooooo much fun with my girlfriends in our Skinny Supper Club ! L>R Linda Knight, Judi Knight, Dean aka Robyn Elliott, + ME . Today’s prompt was filled with lists and more lists, goals visions etc. all good stuff. My vision for myself and my life is to have this kind of fun as often as possible, it fuels my art and everything around me. And in terms of long term, well the best goal I can have is to be totally in the NOW. That’s my list for tonight fellow art bloggers. Sweet creative dreams and artmaking tomorrow. This is one of my favorite pieces and is a painting of my dear friend and art colleague Egle’ Gatins. This period of painting for me was rich with subject matter that symbolized my love for color and patterns and also dolls. There were many layers of depth and meaning including for me symbolism representing the feminine . Egle’ is even painted as if she were a giant doll. And in fact I did use a life size maniquin in my still lifes as model, one I rescued from the garbage, (a practice one the nursing students at Grady Hospital used). I was primarily influenced by the French painter Vuillard, a contemporary of Bonard and Matisse. The series of paintings that I produced after this one just poured out of me, and I worked on this series for a couple of years. This work was some of my favorite; it was powerful, and flowed so easily. Recently I have been pulling out drawings from this time and feel an urge to integrate elements of this work into my current artwork. Ruth was in exceptional spirits today , we so enjoyed sitting in the sunshine and listening to the birds and sounds about us. Spring is for sure coming, Ruth is an avid gardner and I think being surrounded by trees, flowers blooming, nature will aid in her healing. So grateful for her in my life. This is my dear friend and respected art colleague, Ruth Laxson. Ruth had a retrospective of her work at the end of 2013 at MOCA Georgia. Her art is powerful and was developed over 45+ years of work in her studio. She will be 90 years this summer, and even after a recent stroke, her love and spirit are strong. More than anything I Love Ruth for who she is and the big heart with which she loves so completely, without judgement. Oh, that I might be remembered for that as well. When we part Ruth always says ” Good bye for now”, you’d have to just hear the tone and the imense love contained within the way she says it. I saw a list once where very young children said what thier definition of Love is. One I will always remember is “Love is: When you know your name is safe in someone else’s mouth”. May it be so in my life as well, it is with Ruth. make art. live Peace. 2014. Today is the first day of my committment to blog for 15 days. This committment is ignited by C4 Atlanta and in collaboration with artists from all over the world who choose to particapate. There are many answers for me to the question: “Why do I create art” : some key words, to have the patience to believe Peace is possible. Making art is my journey, and my life path. Honored to be interviewed for Current Women’s Caucus for Art Georgia Newsletter Feb.4.2014. Header image: “The Dream of a common language” by Callahan McDonough. 1.Who are you, what do you do, and what is your background?I am an artist, a painter and print maker and have been for over the past forty years. I received my Bachelor of Visual Arts from Georgia State University in 1970. It was an exhilarating time for art at GSU and I had some wonderful mentors, teachers and friends. Jim Sitton, Medford Johnston and some amazing fellow students really changed my life and how I thought about my art. Happily, I earned a scholarship for graduate school in the art department at the University of South Florida. Unhappily, my mother fell ill and I left grad school to care for her after completing one year of the two-year program. ‘Reality takes precedence’, another mentor, Pauline Clance, PhD would say to me later. By the way, Mom is doing fine and lives in Florida all these years later. After Mom recovered, I returned to Atlanta and worked as Director of the Techwood Homes Girls Club. About this time, the Feminist movement was kicking in gear, and I immersed myself in the Feminist Women’s art movement. Along with 30 other women artists, we started the Atlanta Women’s Art Collective, as well as the co-ed Art Workers Coalition. Both of the organizations were pivotal in changing the art scene in Atlanta. We were lucky to have Maynard Jackson in office as Atlanta Mayor. He was a big supporter of the arts and started the Bureau of Cultural Affairs, which gave a sense of camaraderie and unity to a multitude of Atlanta arts organizations. There was a window of about ten years when it felt as if we were experiencing a contemporary version of the Renaissance in Atlanta. Interview with Callahan McDonough continueAlong the way my life became more complicated; my marriage broke up, but I had a wonderful 2 year old son, Zach. It was clear, however, that selling a few paintings, and writing grants would no longer sustain us financially. I needed an instant way to make a living, be able to be the Mom I wanted to be, and make my art. So like many artists, I created a business (cleaning houses) to pay the bills. It grew into a full-fledged business, which I ran for nearly 25 years. Some of you may have heard of “Sparkle Plenty”; that was my business. I called it my “single mom and artist” survival kit. I was hoping my art would sell consistently, enough to let the business go; or that the business would become less demanding, and support my art career. Despite the fact that I was in the Fay Gold Gallery and selling reasonably well, the money was not enough to support us. I decided to go back to school and get a Masters of Social Work so I could have a private counseling practice and still have flexibility to raise my child and do my art. This career move finally worked; I have been in a rewarding private practice for more than 20 years. Recently I reduced my client load to one day per week and now have the freedom to have the kind of studio time I want. Also, I remarried five years ago and am enjoying the companionship and support of my husband, Bill Pope. 2. What’s integral to your art and art career? Oftentimes people ask me how psychotherapy and art are related for me. My answer is that both psychotherapy and art are about making the unconscious conscious. One is direct and interactive; the other is studio work, and more reflective and singular. Both contribute to who I am as a woman and an artist. Also integral is my awareness of the work of historical and contemporary artists, as art history has always provided a context for my work. 3. What themes do you pursue and what medium do you use? My themes seem to fall into two categories. One is Narrative, which includes the Spiritual/Political/Personal aspects of my life,. The other category is more abstract and lyrical. Both are characteristics of my self-expression and artwork. Recently, I have been collaborating with a spiritual writer, Ronna Detrick, in Seattle who is re-defining some of the women from scripture to show them through a Feminist viewpoint — as empowered and empowering, not just pawn’s in a man’s world. I am doing a series of prints that represent these women first as painting, then as a print. I also intend the work to communicate and connect with all kinds of people, in some way. Of course, one of the wonderful things about art is that interpretation is up to the viewer. 4. What makes you angry, what makes you happy? My desire is that, by creating more of a sense of community, we will all win. Living in a world that over emphasizes the ‘individual’ (what we call in Social Work, rugged individualism) is opposed to choosing the ‘whole community’ concept that encompasses a world that works for everyone, with no one left out. I believe our current lack of cultural expression has become the source of much suffering, often as reflexive violence, i.e. those who are shut out and cannot join the world will ultimately lash out. We can do better, and that makes me really angry that we have culturally not made that shift. On the other hand, I feel hope and happiness as I have experienced the capacity for kindness and generosity that so many people have, and I see this tendency growing. For example, some of the organized expressions of hopeful change include: The Feminist movement, Civil Rights, Gay Rights, One percent, Ecological movements to name a few. 5. Who and what inspires you in your work and in your life? 6. What superpower would you like? Soooo many: Kiki Smith, Louise Bourgeois, Cindy Sherman, Frida Kahlo, Judy Chicago, Sonia Delaunay, Guerrilla Girls, Ruth Laxon, Jim Sitton, Med Johnston, David Hockney, Bonnard, Vuillard, Julian Schnabel. 8. What advice would you give to other artists? First, know that not everyone is going to make a great financial living from their art; it rarely has to do with the quality of the work but myriad variables get between a work of art, and a remunerated work of art. If you don’t want to be cleaning houses all your life, get another skill that complements doing your work. Lastly, if some limitation won’t allow you to do your work, treat it like an assignment from art school and get it done anyway. Some of my best work came out of those tough circumstances. In the second week of May 2013, following Callahan Pope McDonough’s art opening of “A Sword of Moonlight and Imperishable Love” at Sight and Sound Gallery in the StudioPlex, I ventured to the Old Fourth Ward, to Callahan’s loft space where she works and lives. Hallelujah for the light and spaciousness of her studio living space, for it elevated me to an altered state of consciousness. Afternoon sunlight illuminated her large colorful paintings, which spoke loudly and deeply to me. Callahan’s organic gluten free chocolate chip cookies and herbal tea kept me grounded as we engaged in the following interview. HALLELUJAH TRUTH: Give me your personal definition of ART. CALLAHAN: Well, that’s like saying what’s my definition of God? There are different ways to go about defining art. There is a lot out there today that’s called art, and it’s not art. In some ways it easier to say what its not, overall, it’s complex, subjective and mind boggling. HALLELUJAH TRUTH: In this moment, how would you go about defining art? It’s okay if your definition is primitive. CALLAHAN: When I was in art school— the big “A” art was a constant source of debate. In my view, this big “A” art has to have some kind of relationship to art as it relates to art history. A sense of context, even if one is defying art history, you have to have it in your bones what you are making in relationship to the art, the history that’s preceded. Some exceptions to this would be naïve artists, like Howard Finster.I guess, my definition of art is that it has relevance and impact beyond the meaning it has for me, the maker of art. CALLAHAN: I don’t know how to explain relevance exactly but that everything is related and has impact. Relevance is another word for relationship. But nobody can ultimately codify this relevance because it is a paradox. Most people who are artists are renegades. The nature of this paradox is that there are two realities, that seem to contradict but within the nature of paradox, both are true at the same time. My sense of it is: relationship + connection of all life forms. HALLELUJAH TRUTH: What is SPIRITUALITY to you? I can tell you what “spirituality” is not. It is not some big guy somewhere in the clouds like a puppeteer, proclaiming: ‘Here I give you goodies today and I withhold goodies from these other folks.’ That is a no brainer. Those paradigms of a deity that no longer serve, they limit us and create confusion. In my view “Religious” institutions have given God a bad name. Religions have been coopted for patriarchal agendas, money and control. There are some religions that are transcending this pattern, but if there is a dogma within a teaching that dictates how we live beyond, love each other and do not harm yourself or another, it’s been coopted for other agendas. There is no specific version of God. We make symbols to convey our pretty limited perceptions of God and that is where art can be profound, elegant, and diverse. Art ultimately leaves the experience in the hands of the viewer. For me, I can call spirituality God, or you can call it Mother Nature or M & M’s. “It” doesn’t need you to name it. I do have a sense that there is something profound about Life itself.In the book, Not God, which was Ernest Kurtz’s PhD thesis about the history of Alcoholics Anonymous, Kurtz describes that his research showed that Alcoholics who came into recovery and had lasting sobriety/recovery where able to make the shift from “I am God” (be there a God OR NOT, whichever is so) to: “I am not God”. What that translates to is that none of us can “carry the worry” or “solve all the problems” or control anything completely. Frequently in childhood we imagine that’s our job and then that causes a sense of being alone, cut off from humanity, anything spiritual, our authentic selves. In my generation, there was so much emphasis on finding identity. There was a kind of narcissism in the searching for me, me, me…. The title, “A Sword of Moonlight, and Imperishable Love”, embodies, for Callahan McDonough, the nature of her current body of art. That is, one of story and of allegory, that symbolizes her life experiences and are depicted in the images in her paintings. These images are intended by Ms. McDonough to be evocative as if we were cloud gazing at the beach; I see elephants, you see something else. She views art as a projection which invites viewers to delve into, and interpret the piece in their own way, to elicit their own story. The result has the potential to connect our personal experience to the collective whole, calling up a depth of meaning that already exists within each of us. Sacred Art – A Collaboration of Ronna Detrick & Callahan McDonough from Trustworthy Video on Vimeo. Thank you to Judi Knight of www.newtricks.com for hosting and interviewing us. Thanks too to Beverly Molander www.beverlymolander.net + Dave Savage www.davesavage.com our video production team.